Headquartered in Des Plaines, IL, with service covering the Greater Chicagoland area, Chicago Kitchen Services is a family-owned independent service company specializing in the repair and maintenance of commercial kitchen equipment and appliances. Founder George Kelly began the company in 1990 to address the need for reliable and dependable commercial kitchen service. He and his team of certified technicians remain dedicated to thriving on tough challenges and striving to keep operating costs low. We serve a diverse customer base ranging from Midwest institutions to chain restaurants, with vast experience with virtually every type of kitchen equipment—large or small, refrigeration or cooking. 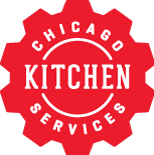 As the authorized parts distributor and warranty provider for the industry’s top equipment manufacturers, we’re recognized as Chicago’s premier commercial kitchen repair service company.